HARTMAN, Edna Minna (nee Zacharias) - Edna Minna Hartman (nee Zacharias) passed away quietly and peacefully on Thursday, January 31, 2019 at Kingston General Hospital. Edna's goal in life was to reach her 100th birthday. She made it to 93. Now she lives on through her family and friends who will help her achieve her goal and more. Edna was born on April 3, 1925 to Emil and Hannah Zacharias on a farm in a German settlement near Otter Lake, Quebec. One of nine children, she left home at an early age to work in Ottawa. The job she loved to reminisce about the most was with the Coca-Cola company. Edna met her future husband, Donald, before he went overseas for active service. After he returned to Canada, they were married in 1945 on New Year's Eve. The happy couple moved to Kingston in 1951. Edna worked for many years at DuPont. In the early 70's they bought two acres of land in Railton and her son-in-law, Nick VanderSchoor, built them their dream home in the country. After retiring, Edna and Don bought a winter home in Sarasota, Florida. They spent 10 wonderful winters there before Don passed away in 2001. Edna continued to spend her winters in Florida for another 12 years. Edna moved into the Royale Place Retirement Residence in 2013. She loved her new residence and was very happy to call it home. With many new friends and activities, her life was full and rewarding. Edna loved to work with her hands. She was an avid gardener and in 1991 she was awarded the Paterson Award for the Village of Sydenham "for the most attractive front garden in each ward, as seen from the street". 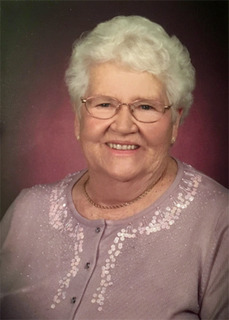 Her other hobbies included sewing, quilting and cooking. Edna's pride and joy was in family. She lives on through her 4 children - Beverley (Nick) VanderSchoor, Ron Hartman, Barbara (Benny) Zimmerling and Brenda (Doug) Dundon, 8 grandchildren - Scott (Mary) VanderSchoor, Tanyelle (Bert) Starke, Tyler (Lee-Anne) Dundon, Tiffany (Rob Stinson) Dundon, Ryan (Tara) Hartman, Cory Hartman, Matthew (Carrie) Hartman and Allyne (Randy Racine) Zimmerling, 18 great-grandchildren and 2 great-great-grandchildren. Edna is survived by 1 brother, Percy (Eleanor) Zacharias. The Hartman family would like to convey a heartfelt thank you to the caring staff at the Royale Place Retirement Residence and to the nurses and doctors of Connell 7 Stroke Unit at Kingston General Hospital. The family invites you to share memories at a visitation to be held at Trousdale's Funeral Home, 4374 Mill Street, Sydenham, Ontario on Monday, February 11 from 5-8 p.m. Funeral will be in the funeral home chapel on Tuesday, February 12 at 11:00 a.m. Interment at Yarker Cemetery. For those who wish, memorial donations may be made to the Heart & Stroke Foundation of Canada or to Diabetes Canada. "Mom... you taught us so much, except how to live without you."